1. The lease is considered a lien so when you sell your home your buyer’s credit must qualify for the lease and the buyer must be willing to take over the lease. 2. If the buyer does not want the lease you may have to buy the system outright from the leasing company or pay the penalties to have the system removed. Taking out a loan to buy rooftop solar can save as much as 29 percent over lease arrangements, according to a new analysis from the National Renewable Energy Laboratory. Of homeowners who go solar, about two-thirds nationwide opt for a lease or similar power-purchase agreement. Under lease financing, the solar provider both installs and owns the rooftop solar panels and related wiring. Customers pay a monthly bill for solar energy, which is cheaper than what they would otherwise pay the utility. That carefree arrangement, with maintenance costs included, offers immediate savings with no money down and has helped democratize solar among cash-strapped households in the wake of the U.S. financial crisis. But homeowners can now do better by borrowing money to buy a solar energy system, the Golden, Colo.-based federal energy lab found. 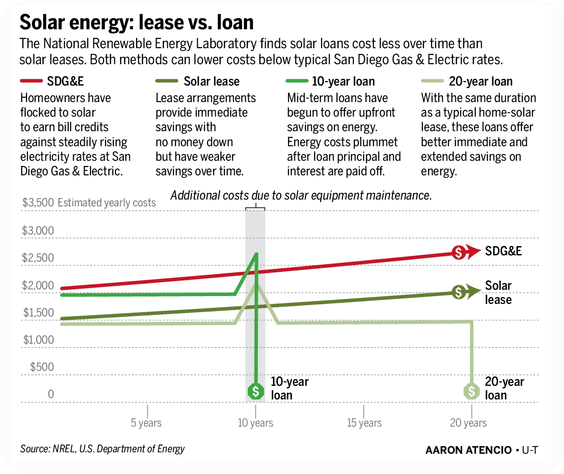 Today’s low-interest solar loans are offering substantially better savings on energy over the same 20-year period as a lease. Longer-term loans, of 10 or 20 years, offer immediate savings.